"I combined overnight oats with blueberries, banana, and almond vanilla milk and turned it into a yummy blueberry smoothie bowl! Top with whatever seeds, nuts or berries you enjoy!" Combine oats and 2/3 cup almond milk in a bowl; refrigerate until oats have absorbed the liquid, 8 hours to overnight. Combine oats-almond milk mixture, remaining almond milk, banana, 1 cup blueberries, vanilla extract, and maple syrup in a blender; blend until smooth. 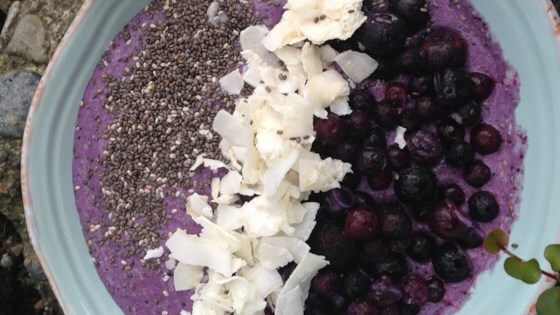 Pour smoothie into 2 bowls and top with coconut, 1 tablespoon blueberries, and chia seeds. A filling smoothie bowl that’s great for weekday mornings! Agave nectar can be used in place of the maple syrup, if desired. Substitute 1/2 vanilla bean (scraped) for the vanilla extract, if desired. This my first smoothie bowl and I loved it! Easy to make and it tasted great. This was very yummy and filling. I omitted the coconut since I didn't have any. Still delicious. My daughter enjoyed it too.